Varsity boys golf team practices puts on the green. The team is very lucky in the fact that they only lost one senior off the team. A majority of this year’s varsity lineup are returning veterans, making the team even more confident in each other. Returning varsity golfer, sophomore Kyle Gibson describes the varsity lineup. “We only lost one senior and gained two incoming juniors [on varsity]. 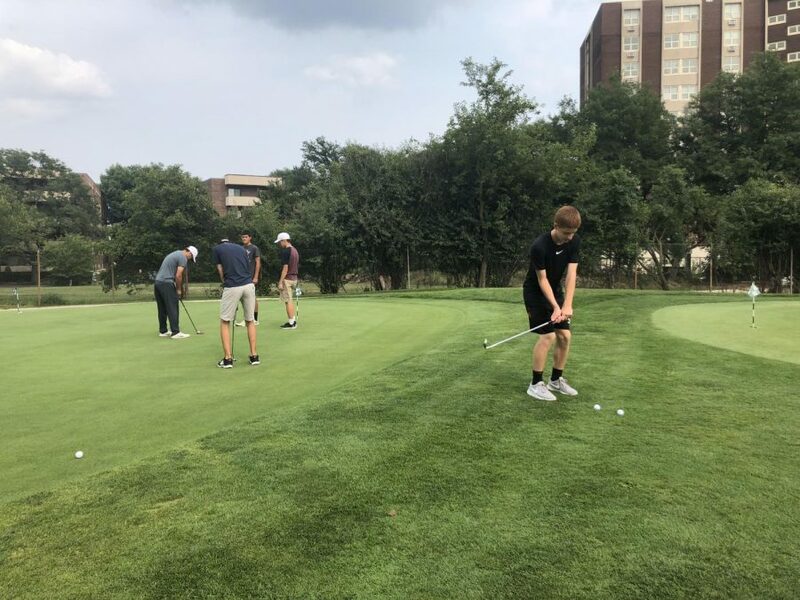 I expect us to do a lot better than last year as our incoming sophomores improve, and our incoming seniors continue to ball out in their last year in golf,” Gibson said. Even though only one senior was lost from the program, there are new golfers of all grades joining the mix. “I think the biggest challenge for the varsity golf team this year is staying consistent [in our game play]. We have a lot of new golfers coming in to play with us this year, and it could be a big challenge for us,” junior Paul Hardin said. However, with new incoming players comes big expectations. The team has a wealth of confidence in each other that can push them to achieve their goals. “My expectations for the team this year is to get better everyday and learn more about the game. We have a unique team with a variety of skill sets. We are both young and advanced as well, so I’m very excited to see what this year brings,” Gibson said. Varsity golfer, junior Andrew Pabst thinks highly of the team’s dynamic. “We expect to be a good team because we have that nice mix of freshmen and experienced upperclassmen. The blend gives the younger players a few guys to look up to and learn from,” Pabst said. The team’s first match will be on Wed., August 16 at the Chick Evans Golf Course in the Maine-Niles Shoot Out.